Are you a bride to be planning your wedding shopping in Kolkata? This Kolkata Lehenga Shopping guide will ease your bridal shopping experience. In this post, you will see designer names, Kolkata Lehenga store names, Kolkata Bridal Market locations along with bridal lehenga and bridal saree prices. I have tried really hard to include every possible Kolkata Lehenga Shopping Stores that I would like you to visit. In case I do miss out on a good lehenga label, please let me know. 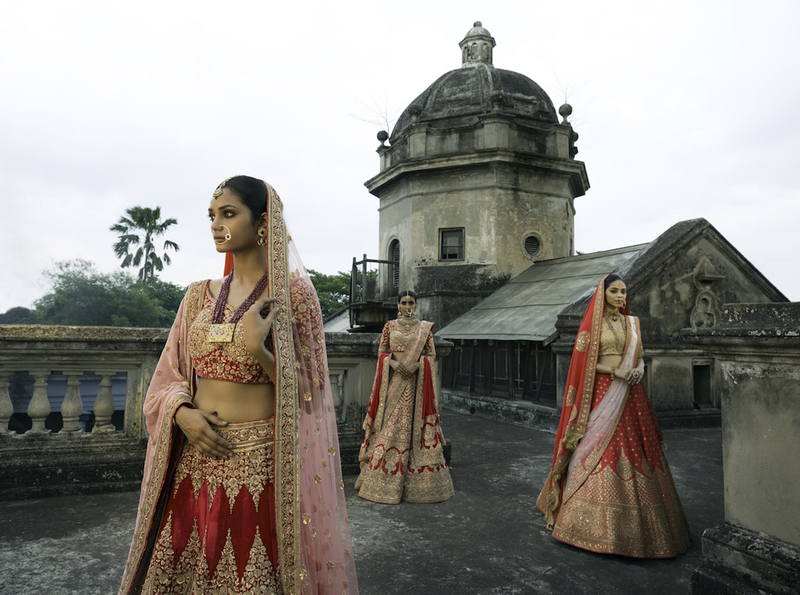 When I think about Kolkata, designer duo Swati & Sunaina are my first choice. Mind you, their designs are expensive. But they do amazing traditional silk sarees and lehengas. If you want to really get a taste of luxurious Kolkata Lehenga Shopping then Swati and Sunaina are the place to be. Their lehengas are heirloom standards which can be re-worn again and again and passed down generations. Every single design of theirs speaks volumes about culture, heritage and old world charm with a modern take. Usually, you can find a gorgeous Swati & Sunaina pure silk lehenga set in the INR 1 Lakh price range. Her silk sarees are typically priced above INR 40k. If you are looking for bridal outfits with a lot of tradition in mind, then do visit their store. One of the famous fashion week designers. Saroj Jalan is one of the most sought after premium bridal wear designers from Kolkata. If you’re taste is heavy embroidered sarees and lehengas which are rich in tradition and heritage, then you must check out her label. Her prices are typically on the expensive side. But if you want to get a taste of premium Kolkata Lehenga Shopping then this can be a start. The different assortment of silk and velvets are adorned with the craftmanship of the era of Nizam of Hyderabad and the élan of the British crown, with works like darning-filling stitches, zardozi, salma, dabaka and mukaish among others inspired by Bidri Art. The garments have breeches, cuffs, collars, gathered skirt and puffed sleeves with the silhouettes inspired from the beautiful Nizam Court highlighted by the pastel shades of rose, pink, olive green and vibrant colour of red. Don’t go by the pictures alone. Saroj Jalan as a designer can transform you into a queen by dressing you in her bridal garments. The first time I came across Saroj Jalan was when she showcased her bridal collection at LFW 2016. I just fell in love with all the looks from that show. Classic reds and greens in lehengas. You have to see that shows pictures to know what I’m talking about. I’d never find the prices of Saroj Jalan bridal lehengas had it not been for Flyrobe. You can now rent these heavy bridal lehengas from Flyrobe instead of dropping a bomb of money on it 🙂 You’re welcome by the way. If you wish to buy a designer lehenga, but don’t have a designer in mind. Then Kolkata Lehenga Shopping can also be done at any of these multi designer bridal stores. Now, you don’t need to shop in Delhi or Mumbai to get your hands on the latest designer bridal wear. All of these stores have an amazing range of designers on their panel. So whether it is a premium designer lehenga, or a mid budget designer lehenga you’re looking for, you’ll probably find it here. Another thing you can do before visiting these stores is look through their list of designers they represent. Check the designers online, as most of them sell their outfits on e-commerce sites as well. It will give you an idea about budget, latest collections etc. Want to get a premium designer bridal lehenga? But can’t shop in Delhi or in Mumbai? Well, then Vedam is your Kolkata Lehenga Shopping destination. They have an exclusive range of premium designers like Gaurav Gupta, JJ Valaya, Tarun Tahiliani, Soltee, Archana Kocchar, Manish Arora and more. All their latest bridal collections etc can be directly purchased from this store. If you are looking for traditional Patola sarees and lehenga, or silk lehengas. Then Vachi is a good place to check out. They have designers like Jayanti Reddy, Gaurang Shah, Manish Arora, Rohit Bal etc. So overall a good store to check out both bridal and pre-bridal wear. But keep in mind, you got to have a healthy budget. 85Lansdowne is located in an 80-year-old mansion spread over two levels. The list of designers showcased in this store is endless. Literally speaking. If you’re looking for silk, Banarasi lehengas, then they have Jayanti Reddy, Sabyasachi, Raw Mango, Ekaya, Anuradha Vakil. For Pre-Wedding lehengas, you can look at Ridhi Mehra, Payal Singhal, SVA and many more. Some of the other prominent names featured here are Tarun Tahiliani, Rohit and Rahul Gandhi, Rajesh Pratap Singh, Payal Singhal, Nachiket Bharve, Meenakshi Dadoo, Divyam Mehta, Varun and Needdhika, Samant Chauhan, Kiran Uttam Ghosh, Namrata Joshipura, Gaurav Gupta. They also have exclusive Trunk shows by Suneet Verma, Manish Malhotra, Anuradha Vakil, Shantanu Goenka, Abha Dalmiya, Ekaya that you can check out for your bridal shopping. The more and more I dig into this store, the more I love what I see. Fresh designers, new looks, perfect for a young vivacious bride. Citrine Kolkata has a plethora of new and upcoming designers along with seasoned favourites. For Pre-Wedding Lehengas, my favourite designers in this store are Mani Bhatia, House of Masaba, Mishru, and Summer by Priyanka Gupta. If you’re looking for budget lehengas, then have Amrita Thakur, Chamee & Palak, Avnni Kapoor, Label Renee, and Astha Narang. Some other designers worth checking out in this store are Anoli Shah, Pink Peacock Couture, Kresha Lulla, Samant Chauhan, Monisha Thahryamal. Citrine is one of the leading luxury multi-designer store in Kolkata. You can find both bridal, Indo-western, and ethnic wear here. No lehenga shopping in a city is over without visiting some budget friendly retail stores. Kolkata Lehenga Shopping can be done in any of these big retail stores. I am sharing two of my favourites here. For a mid budget range of INR 15k to INR 50k, this store is a good place to check out. From their online store, I can see they have raw silk lehengas, and other budget bridal lehengas that are decent looking. I am sure their store will have a much wider range of bridal wear to choose from. But here I’m sharing two of my favourites from their online store. If you’re looking for a designer replica, specifically Sabyasachi replicas. Then this store has it at unbelievable prices. I am not entirely sure of the quality of these replica lehengas. So not sharing any pictures or prices here in this post. However, they also have their exclusive bridal wear and fusion wear collection which makes more sense looking at the price. I say makes sense because sometimes the price vs the picture of the lehenga have no sync. A Sabyasachi original photo of a lehenga cannot by any chance be available for INR 5k to INR 10k price range. So I would ideally suggest visit the store only because they have their own set of bridal wear as well. Don’t look at the writing on the picture. But just have a look at the garments alone. Bon Bibi Kolkata does some amazing trendy bridal outfits that are modern yet traditional in its look. I contacted the designer but unfortunately, haven’t got around getting better pictures or information from them. I tell you Kolkata is hard to work with. But in case any of you’ll have stopped by their store, I would love to hear what you have to say about their collections. If you want a designer lehenga and your budget is between INR 40k to INR 1 Lakh, then check out the bridal collection by Sejal Kanoi. Her website doesn’t really have that many lehengas on display, so not sure of her bridal style. Maybe one of you can check her collection out and let us all know here. 2A, Sarat Bose Road, Kolkata 7000 20. Mob : +91 98309 19800 Landline : +91 33 2476 2140, +91 33 2476 3182. I just happened to come across Onaya by chance and I absolutely love what they have to offer in terms of wedding wear. If you are a bride looking for an end to end solution for all your bridal, pre-bridal and occasional wear, then Onaya is the place to check out. They have beautiful trendy gowns, lehengas, fusion sarees and ethnic wear in their collection. I don’t have any idea about prices, but no harm checking them out right? All of the Kolkata Lehenga Shopping stores mentioned henceforth are budget stores. If you wish to buy anything from INR 5000 to INR 50000, these are the top markets and shops to check out. Mind you, I haven’t been to these myself. So in case any of you’ll have been here and have a different perception, please do tell. So the rest of the readers can benefit from the information. From what I’ve researched, customer service is a big issue in this store. However, if you are planning to buy trousseau sarees or even your bridal saree, then customer service shouldn’t really matter. All you have to do is go check out the collection, buy from there and be done. Do not pay upfront for a pick up later and things of that sort. They even have YouTube videos showcasing their collection of sarees. They seem to have everything in silk. So make sure you check that out to get an idea of what kind you might find here. If your budget is under INR 10k for a bridal lehenga, then this store is a must visit. They have a decent collection of budget bridal wear in the INR 6000 to INR 10000 price range. But mostly the store is famous for its range of silk sarees. Visit the website to get an idea of what you can get from this store. It is one of the more prominent famous retail names on College Street. Go here only for buying silk sarees. Kolkata is the hub of textiles, and this store has an amazing collection at good prices. Whether it is baluchari, or pure silk, you will get sarees in a brilliant cost. Their online store also has a big collection on display with prices. Do have a look. I liked what I saw. Oh, I am so glad I found this store. Honestly, I have no clue about lehenga prices. The thing about writing this Kolkata Lehenga Shopping guide is it has been one long roller-coaster experience. Stores and designers took so much time just answering the phone and just getting information out of them seemed like a herculean task. So I haven’t got around talking to all of them yet. This store falls in the same category. I will however, get in touch with them and give you all some price idea of what this is worth. From what I have researched, this Kolkata Lehenga Shopping retail store has everything from occasional wear to bridal wear. They even do exhibitions. So in case any of you’ll have seen them around, do tell what has been your experience looking at their outfits. I have a feeling they do budget lehengas as well. Kolkata as a city is quite affordable when it comes to garments and craftsmanship. A lot of designers source their heavy bridal wear from Kolkata at dead affordable prices. Once it reaches Delhi or Mumbai, there is an additional zero added to the price. So if you’re planning on lehenga shopping in Kolkata, I think you should make this your first stop given the range of outfits on display. If you are looking for traditional sarees, and sarees for gifting, then this store has it all. You can check out their official website to see the range of saree fabrics they have. All the prices are given, so it’s easy to browse through. They do have some budget lehengas in the under INR 10k as well. But they are not your bridal lehengas. May be sister of the bride kinds. Do you have any other Kolkata Lehenga Shopping recommendation that I should include on this list? A Very beautiful collection you have i really like all of it. Very beautiful outfits which Kolkatta u mean Is it Calicut or Kolkata ps. mention exactli which city . do u catch flight from Mumbai and how far . thanku. Elegant and graceful, lehenga choli collection.Choose from Meraj’s exquisite collection of Banarasi, velvet and raw silk embellished bridal wear lehenga cholis.